These excellent shots were contributed by Andrew Charles who took them in 2005 the vehicle was restored by its present owner Nick Helliker. This particular vehicle was built for the Foden Works Brass Band who used it to travel to all their concerts until 1979 when it was replaced by another Foden vehicle. It was then laid up at the Foden factory until it was bought by an enthusiast who stored it under cover until the present owner bought it and did a full restoration to the standard you see above. The engine fitted to the above was Fodens own 4·0 litre two stroke diesel engine although there was the option to have a 8·4 litre Gardner 6LW in which case the model code would be PVRG6. I think there would have been a noticeable difference in performance as the Gardner is twice the size of the Foden engine, unless being a two stroke made a difference in which case why did it never catch on with other engine manufactories. The body for the above was built in Scarborough by Plaxton and was based around their Venturer model. I am rather curious to know what the circular grill in the roof above ‘Foden Coach’ is, a large air horn perhaps. Oh does anyone know what the seating capacity is? Lovely pictures of a fine vehicle. Direct comparison of the engine capacities (4.1-litre Foden versus 8.4-litre Gardner) is, as Andrew suggests, complicated by the fact that in the two-stroke engine each cylinder delivers power at every revolution—not every other revolution as in the four-stroke—and so should develop double the torque. You would therefore reasonably expect that with air delivered to the cylinders at atmospheric pressure a 4.1-litre 2-stroke would develop torque equivalent to that of an 8.2-litre 4-stroke, but in practice inlet air pressure has to be well above atmospheric in order to scavenge the exhaust AND fill the cylinder with a clean charge of new air all in one go, so a blower has to be provided. Whether this blower is seen as a mere scavenger or as a supercharger depends on the amount of excess air it provides. On p98 of the 1953 edition of Commercial Motor’s "The British Commercial Vehicle Industry" the Gardner 6LW as fitted to Foden passenger vehicles is shown as developing 358 lb/ft torque at 1,300 rpm and the Foden 2-stroke engine as giving 350 lb/ft at 1,500rpm. Gardner maximum power is 112 bhp at 1,700rpm against the Foden’s 126 bhp at 2,000 rpm. Not much difference in on-paper torque, then, but in real life you had to keep the Foden engine spinning, as low-speed torque fell off alarmingly. Hence the need for the 12-speed gearboxes used for example in those wonderful howling Hoveringham gravel lorries. 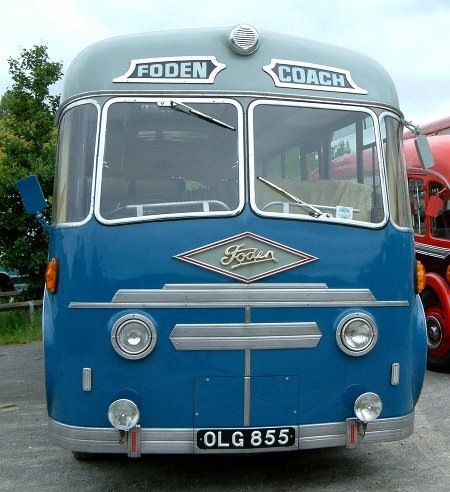 I’ve never driven a Foden of any kind, but I had a day in a 3-cylinder 2-stroke Commer coach belonging to Spiers of Henley-on-Thames which really NEEDED its 2-speed axle to allow you to keep the engine whirring within it optimum range. My guess is that the Foden 2-stroke didn’t catch on with PSV operators because of a) exhaust noise, b) reasonable but not wonderful fuel consumption, c) maintenance costs and d) inability to lug at low revs. Incidentally, Foden later added a turbocharger and planned a 7-cylinder version. Does anyone know what became of it? Memories, memories: this site is therapy. Do I remember that the Foden engine sounded like one of those old dumpers? Presumably the idea was to keep the weight down at the back. I’d say that the grille at the front was a vent- there don’t seem to be many others: it probably pushed the tubas ciggie smoke along a bit…. Lovely looking coach for its time, though. My late father had the opportunity to drive a wide selection of vehicles during his war service with the army and always maintained that the very best lorries were the Fodens. They certainly seemed to uphold this reputation right up to the end – including the small foray into buses – producing vehicles of a very high quality. Surprising then that they did not make bigger inroads into buses than they did – but their niche market of specialist trucks was probably more profitable and time consuming. The Plaxton Centenary book simply describes the grille as an air intake. For engine, passenger or tuba player it does not say. 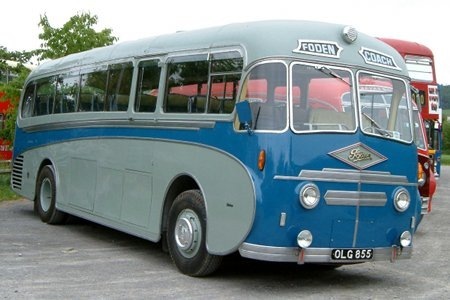 I think the reason Foden didn’t make greater inroads into the bus market was the same as for the ill-fated Daimler CD650 – Fodens were rather complicated and probably rather expensive. Most transport managers of those days were pragmatic and conservative, preferring something familiar that was known to be good enough rather than something unknown that might just possibly be better. As for the two-stroke engine, Ian has explained it perfectly. The reason that torque fell off alarmingly at low revs was that the blower couldn’t keep up, and so alternate firing strokes would become weakened as the engine tended towards a four-stroke cycle. I owned the ex Samuel Ledgard two-stroke Foden coach ONW 2 (front-engined) for a short while. My impression was that it was smooth, powerful and effective as a coach, but would have been hopeless for bus work. It also tended to stall when manoeuvring, as the torque would suddenly be halved by the four-stroke effect if the revs got too low. More recently I have travelled in the back of Roger Burdett’s rear-engined two-stroke, and noticed a distinct chugging sensation as it pulled out of roundabouts for the same reason, since with a wide-ratio gearbox it isn’t easy to keep the revs up. Peter I never drove ONW 2 as I was at Otley and Ilkley Depots, but I have the most vivid memories of the stretch of the A64 dual carriageway at Whitwell. The road has a high summit and a deep trough at both ends, and many’s the time ONW 2 could be seen in the offside lane overtaking virtually everything in sight. Once in full flight that fine machine could really swallow up the miles but, as I’m of limited technical knowledge, I’ve found your explanations of the two stroke limitations most fascinating. Ah the 2 stroke Foden. My short stint as a driver for Transglobe (B’ham) brings back the memory of one of my nosier ‘steeds’ – and having to take it to the Foden works (Sandbach) for diesel pump adjustments. I think it had a Duple body. Engine aside, perhaps a major reason the Foden PVR was unsuccessful was that it was fitted with Lockheed continuous flow hydraulic servo braking. Other manufacturers also tried this (Daimler, Dennis) and would be buyers stayed away in droves. It was not that brakes were particularly poor (though in the case of the earlier Fodens, if the engine stalls than braking is reduced to practically nil) but sheer complication of the system and potential maintenance problems were enough to keep people away. The only bus that really saw success with a system like this was the Routemaster which took the might of London Transport’s engineering development to take the bugs out of the design. I am, incidentally, the current owner of another Foden PVR coach, VRF 372, currently in restoration. Chris Youhill’s comments about ONW 2 overtaking nearly everything in sight reminded me of a report from a Commercial Motor correspondent, Alfred Woolf, who hitched a ride on Salopia’s HUJ 996, one of their rear engined Observation coaches, on its way to the Nice Coach Rally. Covering 800 miles in three days on roads of dubious quality, the coach ‘left most other public service vehicles behind, even those with more powerful motors’ and ‘provided that the engine speed is kept up, few vehicles can climb as well as the Foden’. On some stretches of prime Belgian pave, flat in nature, speeds of 60 m.p.h. were seen – and maintained for many a mile. The coach took the Grand Prix du Confort et de l’Elegance award – Whitson’s fifth such award! Another rear-engined Foden, OLG 968, was taken by Fodens on an Alpine Tour to test its suitability for Continental touring. Admittedly driven hard, to assess its capabilities, the coach averaged 30.2 m.p.h. and 10.8 m.p.g. over a total distance of 2,850 miles. This included scaling no fewer than five high Alpine passes, most of which were loose surface roads! I have heard an apocryphal tale that the coach was clocked by one German driver in excess of 80 m.p.h. – downhill and out of gear! Average speeds on the German autobahns were over 50 m.p.h. and even the long run from Strasbourg to Paris (302 miles) on standard main roads was completed at an average speed of 36.4 m.p.h. Yes, the two-stroke engined coaches were fliers, but you had to keep the revs up to get the best out of them. I think that must be a pic of the great Fodens bus that my father talked a lot about. He has fond memories of his days at Fodens Works at Sandbach. He was there for six years in the sixties then came home to run the family business of eight wheel Fodens. I have heard many a funny story involving that machine. Does Billy Harrison ring a bell to anyone? I think that as well as a higher purchase price and the complication of the braking system, another problem with Foden PSVs particularly in the coach application is that of resale value, here the two stroke was particularly likely to depreciate heavily, at least you could take a 6LW out and use it in about 60% of other heavyweight buses and coaches of the same era.